Manual hand-operated gear drive winches, model HWG-600, are designed for many lifting, lowering and pulling applications. Equipped with a load pressure brake. This brake holds the load at any required height during hoisting and lowering and prevents and unintentional lowering of the load. Adjustable crank handle for fast lifting of smaller loads, resulting in lowest possible handle effort and rapid winding of he rope. All rotating parts are maintenance-free. Suitable for operation in ambient temperatures of 14° through 120°F. Capacity 600 lbs. 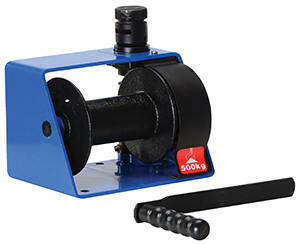 Worm gear winch, model HWV-1000, allows for better load control and features a reinforced frame, comfort-grip handle. Worm gear provides load holding capability when handle is released. Reel stops automatically, locking load in place whenever the handle is released. High quality enamel paint finish, dipped and baked. Crank handle can be adjusted in length. Winch housing and rope drum are made from robust steel plate. Capacity 1,000 lbs. (L x W x H) Wt. 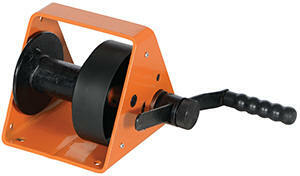 Wall Mounted Hand Winches Pulling devices that use a wire, rope, cable, strap or web to move heavy loads. Constructed of steel worm gear drives with zinc plated finish. Pinion gear shaft with lubricated down bushings provide smooth operation and long life. Stainless Steel Hand Winches are constructed of 304 stainless steel for corrosion resistance. Machine cut spur gears ensure smooth accurate operation, while protective gear covers keep dirt out and help prevent worker injuries. Winches feature copper bushings, a drum clamp for easy attachment of wire rope (not included), and an automatic brake for positive load control during lifting and lowering operations. The pulling capacity is in the horizontal position.